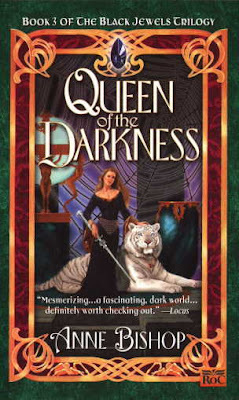 From back cover: The Dark Court Has Been Formed. Jaenelle Angelline has made her Offering to the Darkness, and reigns as queen of Ebon Askavi. No longer will the corrupt Blood slaughter her people and defile her lands. But where one door has been closed, a window may be opened ... or broken through. Even Witch cannot protect the Shadow Realm alone. Somewhere, long lost in the madness of the Twisted Kingdom, is Daemon, her promised Consort. His unyielding love for Jaenelle will complete her court and secure her power. Yet, even together, their strength might not be enough to stave off their enemies. In the end, only a terrible sacrifice can save those Jaenelle loves. Whew, another trilogy that I can scratch off my list! I always have trouble finishing series, even those I really enjoy. I just tend to stall in the middle somewhere and never get going. But this one, I am done with! I liked this book, but not as much as the other ones. There seemed to be a lot of almost teenage angst in it between Daemon and Jaenelle, and it also skipped over about seven years from the prior book, and I feel like I never really fully caught up. A lot of the book also seems to be spent waiting around for the last fifty pages or so, when most of the action takes place. Was the book good? Oh, yes. I think my reading rut has been eradicated completely. But was the book as good as its predecessors? In my opinion, no. It took so long to really get going, and then it seemed to finish up much more quickly than I would have liked. The last page was bittersweet and poignant and, really, perfect- but it seemed like the ending just happened so quickly. And we were left not really knowing exactly what the status of the Blood was, at the end of the book. Which annoyed me. But, luckily, the last page was really just that good that when I closed the book, one of those sighs of contented accomplishment came over me. You know the one- the "Wow, I just finished a really great book" sigh. The "I can't believe this series was sitting silent on my shelf for so long, when I could have known these characters so long ago!" sigh. I think we've all had those moments of bliss before- and for all the quibbles I had with this book, it did incite The Sigh in me, and so it gets an overall positive rating! This was actually my favourite of the trilogy. I really loved it. You do get some form of resolution by reading Dreams Made Flesh, which I reviewed recently, and there is another Black Jewels book coming out eventually! Cannot wait!